If you don't mind not being invited out again, start discussing stools instead of other ailments! Dr. Michael Levitt, an Aussie colon-rectal surgeon says that the gastrointestinal tract was designed to operate best when stools are the shape and consistency of an unripe banana. Oh, but NOT the same color. So if you have the "intestinal fortitude" to broach the subject, here's the whole poop on stools with which to regale your dinner guests! Fiber or Fibre - just eat it! The right amount of fiber is the first step, however you spell it! Normal stools are about 75% water. Fiber in your diet holds onto water, making stools soft as toothpaste. This signifies a healthy stool. Years ago in the Saturday Night Post magazine, there was a hilarious article about the importance of having poop that floats - and it's still true. If your poop doesn't float, you're not getting enough fiber in your diet. So consider adding fiber by Going With the Grain and Know Your Salad Greens. 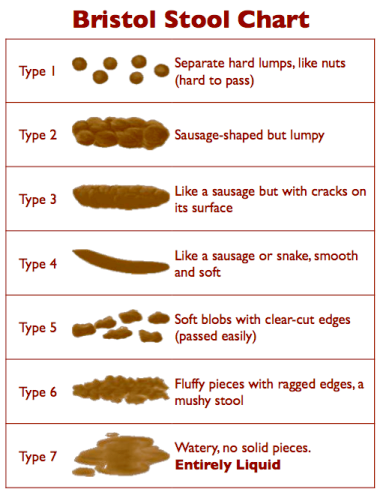 Feces are normally brown from the pigments formed by bacteria and bile from the liver. Bleeding high up in the digestive tract (esophagus, stomach ulcers, etc.) can cause the stool to become black and tarry in appearance. If there is bleeding lower down in the digestive tract (hemorrhoids or colon problem) the stools will be mixed with bright red blood. Anything that blocks the bile duct, or problems with liver or gall bladder will affect the normal flow of bile to the intestine. This will result in pale or white stools. Don't jump to conclusions about a sudden change in stool color. Eating a lot of black licorice or imbibing red wine will cause tarry, dark stools. Blueberries, beets and even paprika-laden dishes can darken stools, and so will iron pills and good old Pepto-Bismol. If you experience these symptoms in your stool regularly without anything in your diet to account for it, then it's time to run (don't walk) to your doc for a thorough checkup. Stools normally contain about 1% fat. If the amount rises to 7%, it creates a condition called steatorrhea. This type of stool is soft, smelly and sticks to the toilet bowl. This can occur temporarily after a fatty meal. If it's happening too often, you may need to reduce or substitute fats in your diet. Check out the Skinny on Fat and Fat Substitutions articles for tips on reducing fat and using "good" fats in your diet. If it's a chronic problem, it is from a lack of pancreatic enzymes and you should consult your doctor. Usually, taking a digestive enzyme supplement will do the trick. How often you go is a very individual matter. Some folks have one to three movements a day, other may go every 3 days. Both extremes and anything in between are perfectly normal. Don't confuse not going daily with constipation. It's not frequency of bowel movements, but the difficulty of having one that signifies constipation. Prime time to be "moved" is after breakfast. Getting up triggers an increase in bowel activity. Breakfast expands the stomach and stimulates the bowels. This tells the colon that "it's time to go". Don't delay a bowel movement for very long when the urge is triggered. Short delays can be good because they cause a more intense urge and an easier bowel movement. In our western culture, "sinkers" are by far the norm when it comes to poop. Please don't drive yourself to distraction trying to achieve a "floater" every time you have a bowel movement. You'll get ulcers for crying out loud! 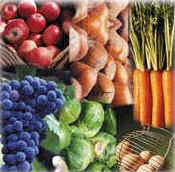 And you can overdo the fiber in your diet if you add too much, too soon, so increase your dietary fiber slowly. But, if your poop consistently floats, there's a chance you might have a malabsorption problem - a dysfunction of the GI tract that affects the body's ability to digest and absorb fat. Acute gastrointestinal infections can also result in increased gas content in the intestines, due to rapid movement of stool through the GI tract. Or, possibly cystic fibrosis, celiac disease, biliary atresia, abetalipoprotenimia could be responsible - all of which cause too much fat to end up in the stool, and all of which require medical attention. So take all things in moderation - including your quest for floaters. Increase your dietary fiber, decrease the fat, and do get an annual physical exam that includes a colon checkup. Then sit back and relax - on the throne!